Basket weaver Karl Heid, 79, can create a large basket in just under two hours of fast hand movements. 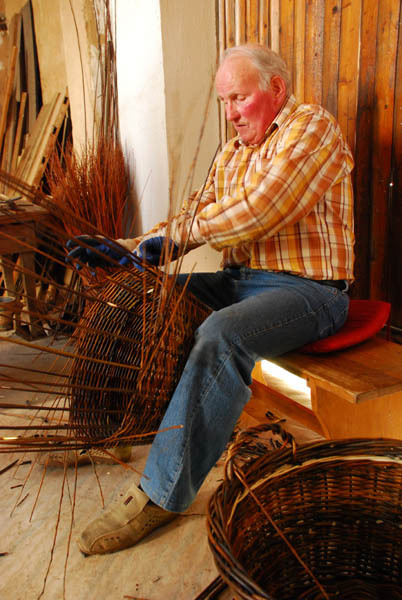 Karl Heid will turn 80 in a couple of months but he’s still busy making wicker baskets the “old-fashioned” way in the village where he was born along the Rhein River. His hometown of Neupotz has a history dating back to pre-Roman times. Surrounded by the serpentine “Old Rhein,” the village has maintained an uneasy relationship with the waterway since the days when the Romans called it “Potz,” or “wet hole.” Throughout the marshes grow reeds which people used to make baskets. This ancient craft was until only about 40 years ago still a major industry in Neupotz, with a factory employing up to 50 people engaged in all manner of wicker furniture and accessories manufacture. Today, there are only a handful of people still doing it. “I earn around 14 Euros for each basket I make,” Karl told recent visitors from Minnesota. When asked how many baskets her produces in a week, he says “around 20. I’m not in this to make money.” His younger brother Emil, the town’s Burgermeister, scoffs at the low price his big brother receives for each handmade basket. “He should be charging two, three times this much for the work he does,” Herr Heid says. “It keeps him happy, it keeps him young,” his grandson Viktor Heid tells us. “He doesn’t want to be rich.” For the people who appreciate handcrafted baskets made from a centuries old technique, that’s a good thing. Posted in Family History Tours, Germany Tours and tagged baskets, heid, karl, neupotz, wicker.